My favorite food discovery during the Eat Travel Write 3.0 culinary tour was the specialty of Kuala Kubu Bharu: asam pedas udang galah, a Malay sour and spicy stew with giant freshwater prawns. 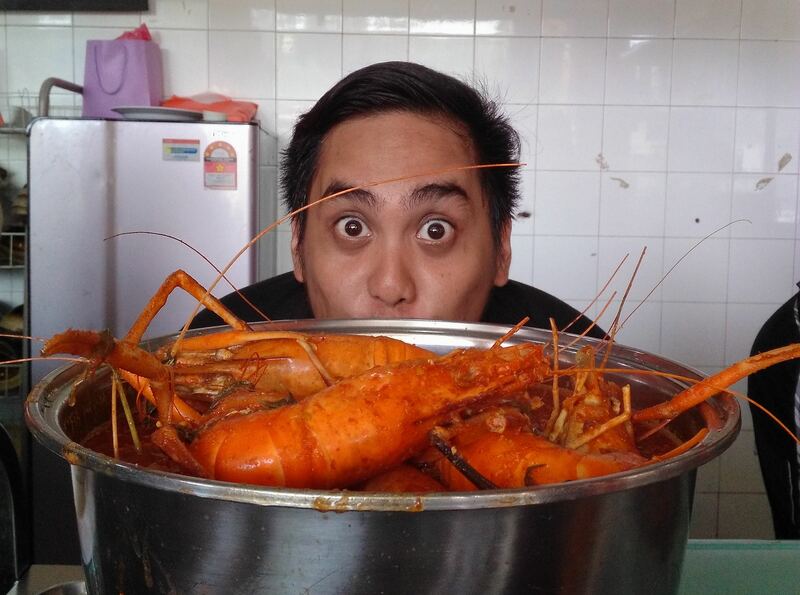 The asam pedas we had for lunch at Dataran KKB were made with the largest freshwater prawns I’ve ever seen! This flavorful dish tasted like Thai tom yum soup. 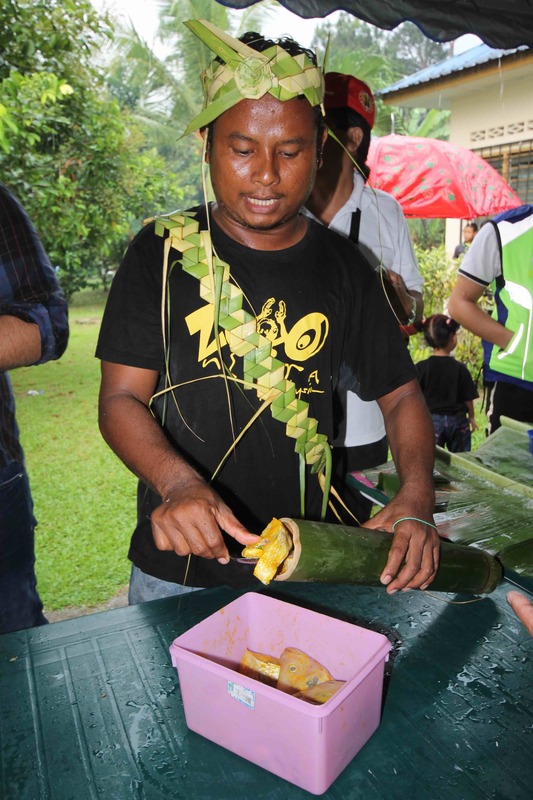 Among the aboriginal communities of Hulu Selangor, one can learn about indigenous cooking methods as well. At the Temuan village of Kampung Orang Asli Serigala, we were treated to a cooking demonstration of nasi buluh and ikan buluh – rice and fish cooked in bamboo. Flavored with only salt, garlic and onions, the dishes were surprisingly tasty. The bamboo also added an appetizing aroma to the sweet and delicate flesh of the catfish and tilapia. 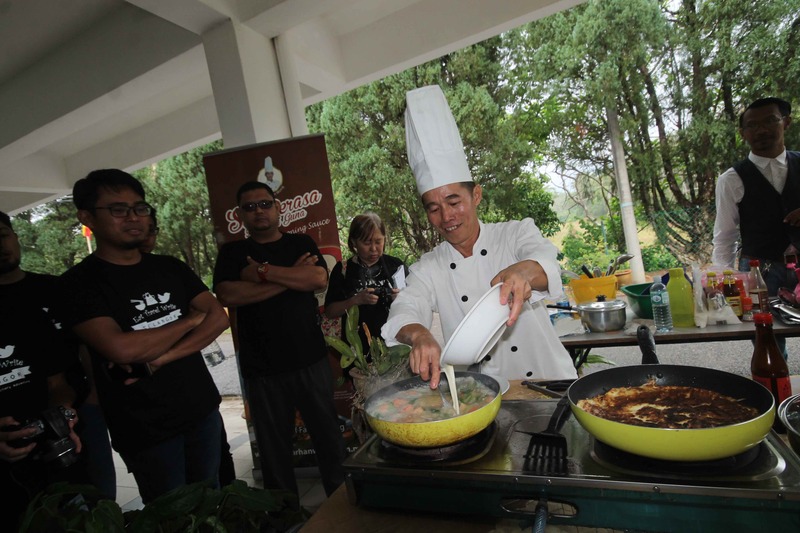 It’s not exactly a dish, but Chef Farhan Wong’s Sos Perasa (Multi-Purpose Seasoning) is a special ingredient you can take home to enhance your cooking. Thanks to an excellent cooking demo by the inventor himself, 54-year-old Chef Farhan Wong, we discovered different ways to use his seasoning (made from a secret blend of more than ten ingredients) in mouthwatering dishes like chicken cheese (this was oozing with goodness! ), chicken chop and “mee kung fu”! For more information on Chef Farhan’s seasoning and cooking classes, visit his Facebook page. 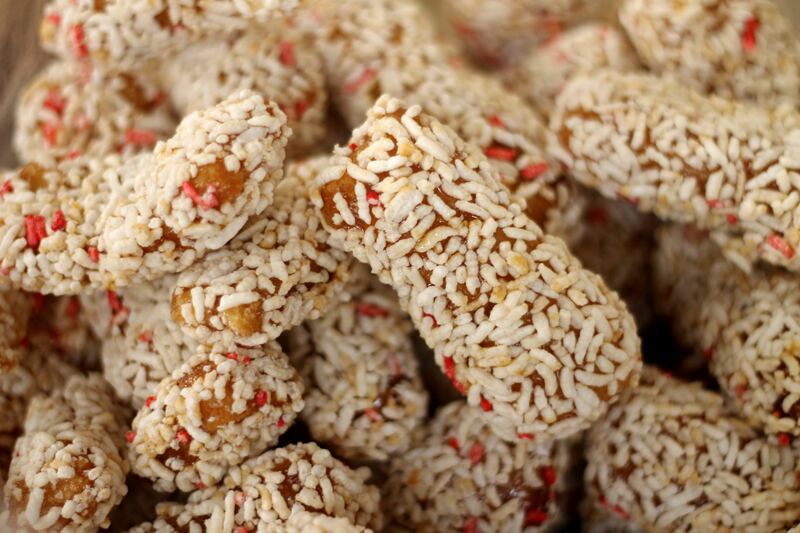 Aside from savory dishes, there are also sweets to be had when you visit Hulu Selangor. The state of Selangor, together with Negeri Sembilan, is home to Bengkulu Malay communities from the southwest coast of Sumatra Island. Tat bengkulu (Bengkulu tart), as it name suggests, originated from Bengkulu province. It is a pastry made with flour, egg, sugar and coconut milk with a sweet filling made from grated coconut, brown sugar and salt. 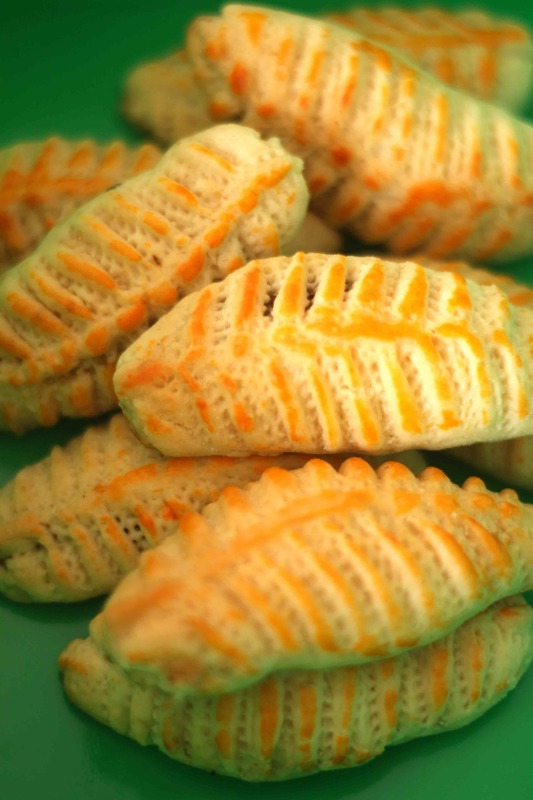 This snack can be found in markets and groceries in Hulu Selangor. Established in 1923, Oh Swee Len (Swee Len Food Industries) is a home-based factory at Kampung Bukit Chandang that specializes in Chinese wedding crackers, mua lao (sesame rolls) and lao huei (rice crispy rolls), which are not mass-produced but made by hand the traditional way. These food items were originally given as wedding gifts by Fujian clans but now they are also enjoyed as an everyday snack. Aside from selling domestically, their crackers are also exported to Singapore and Indonesia. For more information, visit the company’s Facebook page. Like Cameron Highlands or Baguio City in the Philippines, the cool climate of Genting Highlands is ideal for growing strawberries. 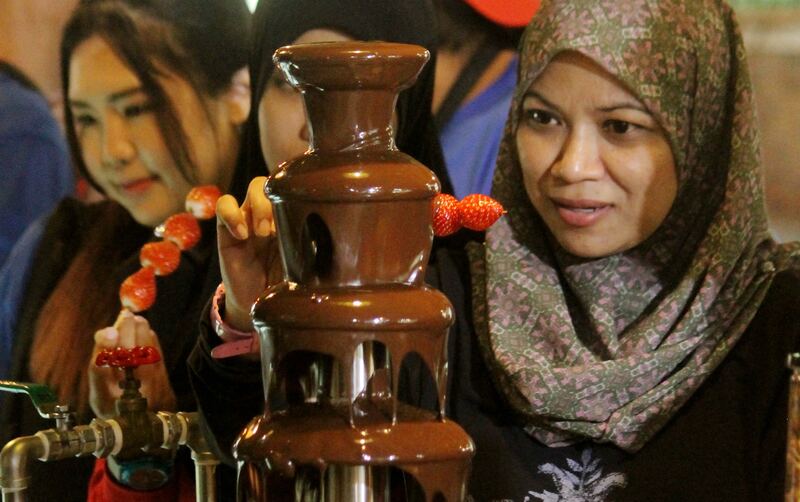 Genting Strawberry Leisure Farm, located on the Selangor side of Genting Highlands, offers a farm complex where visitors can not only hand-pick fresh strawberries but also savor them as desserts in different ways like strawberry juice, strawberry ice cream and chocolate-dipped fresh strawberries! For more information, visit their Facebook page.